Every time we visit the Fort Bragg and Mendocino area, Glass Beach is always on my list of things to do. I am a shell collector at heart and can meander along any beach for hours looking for treasures. 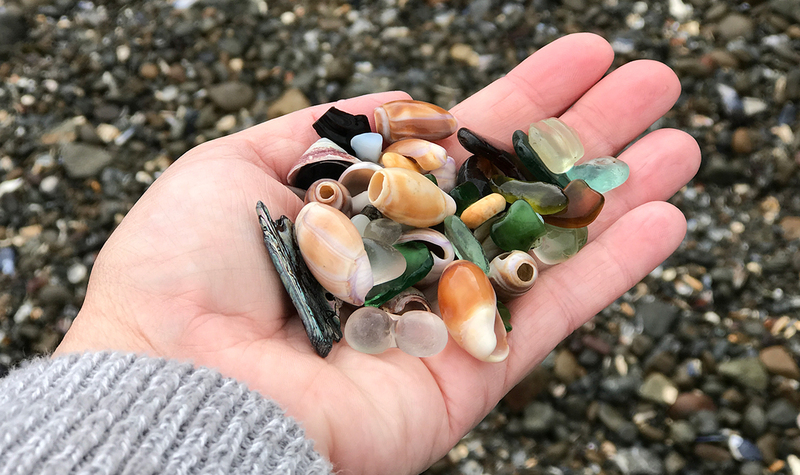 My daughter Natalie feels the same way, so as you can imagine, we absolutely love digging through the pebbles, shells, and sea glass at Glass Beach. Glass Beach is believed to have the highest concentration of sea glass in the world and is one of the most popular tourist destinations on Northern California’s Mendocino Coast. It even inspired the establishment of the International Sea Glass Museum. While most people come to Glass Beach to hunt for beautiful pieces of colorful sea glass, terracotta pieces, and sea shells, there are also many other things to do in the Glass Beach area, including hiking and tidepooling, especially at low tide. The rocky Northern California coastline that surrounds Fort Bragg’s Glass Beach is also a great place to explore tide pools at low tide. When the 1906 earthquake struck San Francisco, it shook the ground all the way north to Fort Bragg, causing brick buildings to collapse, wood-framed home to fall from their piers, and fire to break out. There was so much debris covering the city after the quake that the decision was made to just push the garbage over the edges of the cliffs into the ocean. From 1906-1943, bulldozers simply pushed trash and everything else — cars, batteries, furniture, appliances, bottles, and cans — off the cliffs into the ocean at the foot of Pine Street. The dumping was moved to a new site from 1943-1949 and then moved once more to a site that was used from 1949-1967 when the town finally stopped dumping garbage into the ocean. While the town assumed the ocean would sweep away their discarded trash, that wasn’t the case. Unfortunately, the rock formations along the coast caused everything dumped into the ocean to stay on the beach and not get washed away. As the trash piles grew, they were burned, which has created a very rare and unique type of sea glass called fire glass. 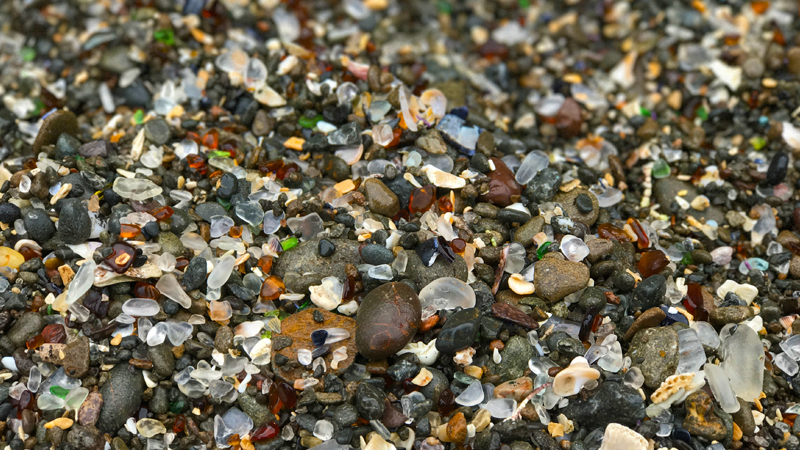 Many years of crashing waves and rolling tidal action have repeatedly tumbled and pounded the glass pieces in the sand until they became the smooth, rounded, colorful, polished pieces of glass you see today sparkling in the sunlight on Fort Bragg’s glass beaches. Here is a handfull of sea glass and sea shells found while exploring Glass Beach in Fort Bragg. The official Glass Beach is part of MacKerricher State Park and protected by law, so no sea glass may be collected there. But there are two more glass beaches to the south where you can collect sea glass. We’ve visited Fort Bragg and Glass Beach several times over the years and until this past trip, I never knew that there are actually three different glass beaches along the city’s coastline. While Glass Beach had easy access and a dedicated parking lot, the other two glass beaches were unknown to most tourists because they were very difficult to reach. Now that the new Noyo Headlands Fort Bragg Coastal Trail, however, the first two glass beach locations are finally accessible to the public. Glass Beach 3 is the world famous Glass Beach featured on postcards and calendars. Used as a dump from 1949-1967, this site has the least amount of sea glass when compared to the other two glass beaches. In 2002, Glass Beach was incorporated into MacKerricher State Park, making the collection of sea glass at Glass Beach illegal. When following the Glass Beach Trail to Glass Beach from the parking lot, turn right to access Glass Beach 3 and left to access Glass Beach 2. Accessible by a steep wooden staircase, Glass Beach 2 is the most popular and most crowded, attracting sea glass lovers and treasure hunters from around the world. It was used as a dump site from 1943-1949. The hours around low tide are the best and you won’t really have to hunt very much as the sea glass is scattered all across the pebbly beach and sand. Glass Beach 1 is also called Treasure Cove. This semi-secret sea glass covered cove was only accessible by kayak for many years, which kept it relatively unknown to tourists. It was used as a dump from 1906-1943 and today you can easily reach this glass beach from the new Noyo Headlands Fort Bragg Coastal Trail, about a quarter mile south of Glass Beach 2. 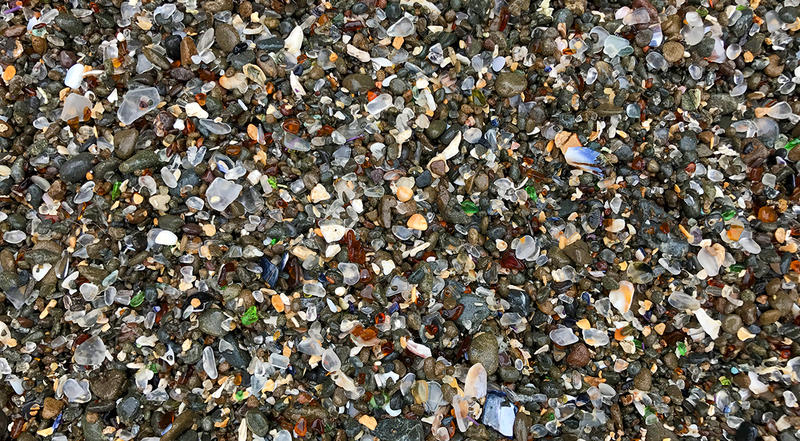 The world famous Glass Beach in Fort Bragg is located in the boundary of MacKerricher State Park, which means all of the sea glass and resources are protected by law and you may not collect or take any from the site. Lucky for you, Glass Beach 1 and Glass Beach 2 are not in a state park and you are allowed to collect sea glass at those locations below the mean high water mark. It’s worth noting that are signs posted asking you not to take any sea glass. Please understand that the sea glass is a finite resource and that by taking sea glass home, you’re depleting the beaches of this beautiful treasure. If you do collect any sea glass, try to limit your spoils to a handful so the beaches remain for others to enjoy. Many websites say there is no sea glass left at Glass Beach, but don’t worry, there is still a lot left! So many people come to Fort Bragg to collect and take sea glass home however, that the resource is being depleted. If you visit one of the two glass beaches that allow collecting, please only take a small handful of sea glass. The official, world-famous Glass Beach is located at the intersection of West Elm Street and Glass Beach Drive in Fort Bragg, California 95437, Mendocino County. In 2002 Glass Beach became park of MacKerricher State Park and now the glass is protected by law and you may remove it from the beach. Free parking and free access. To reach the Glass Beach parking lot, turn off CA HWY 1 onto West Elm Street (at the Denny’s) and follow Elm Street a few blocks to the parking area and vault restroom. Then walk the Glass Beach Trail to the shoreline. While you can’t collect sea glass at Glass Beach (referred to as Glass Beach 3), there are two other glass beaches to the south and you may collect sea glass at those locations (Glass Beach 1 and Glass Beach 2). Noyo Headlands Coastal Trail (map) passes all three glass beaches in Fort Bragg. Park in the parking lot at the end of West Elm Street and walk the wide, paved trail south along the cliffs to the glass beaches. If you do take sea glass from Glass Beach 1 or Glass Beach 2, please only take a few pieces or a small handful.